Even though our hike into Daleville was fueled by joy, our feet were sore. 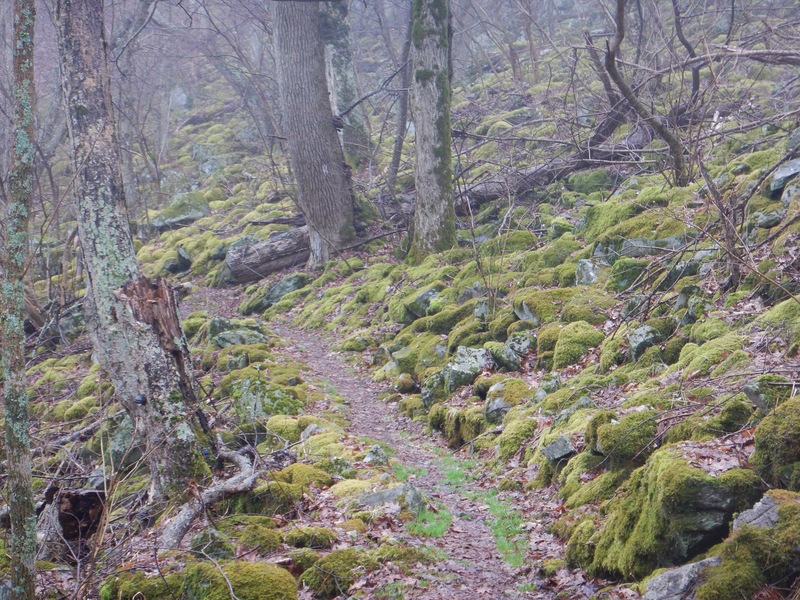 We were still wearing our boots that we started with on Springer Mountain, and had already replaced the insoles once. It was time for a day off our feet and a new pair of boots. This would be the first zero day we have taken not due to weather or Nate’s shin splints. 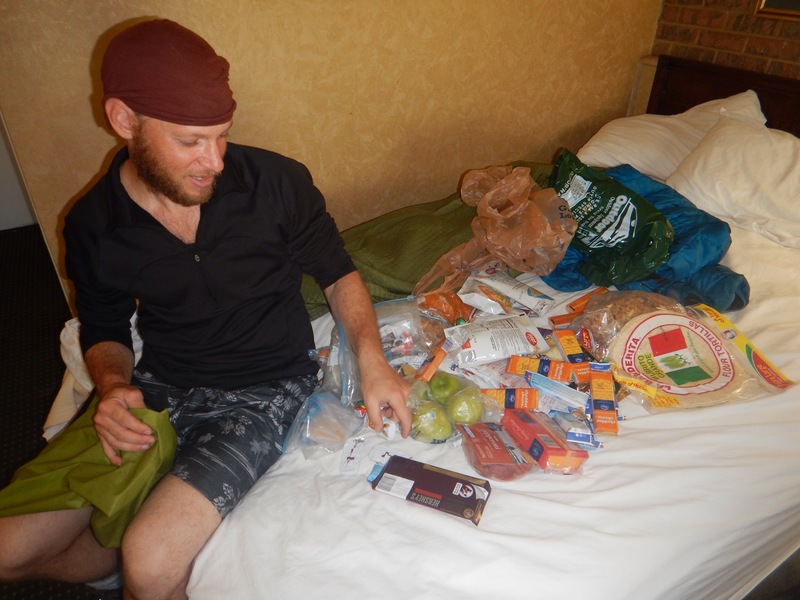 Stretch joined us for breakfast and a quick resupply at the grocery store before he headed back to the trail. Then Nate took me to the gear store. I was excited because they were having a sale. Nate was excited because I was considering buying myself a new pack. Mine had been becoming more and more uncomfortable as the miles flew by, rubbing my back and creating a swollen knob. The woman at the gear store measured the length of my torso and announced that I needed a size small pack, and I began trying on packs from the sales rack. After over an hour, I had found the only pack that did not rub the bump on my back! But the gear store only had a size medium. There was no sense in buying a pack that didn’t fit, so we started searching for the only other item we needed: a fuel container. But the gear store only had alcohol fuel. They told us there has been a shortage of propane/butane fuel canisters after a plant explosion last fall. We left empty handed. We spent the rest of the day writing, editing video, talking to our families, eating and relaxing. For dinner, we went to a barbecue restaurant with Yoyo and Tweet, thru-hikers who we had first met on their way into Damascus. 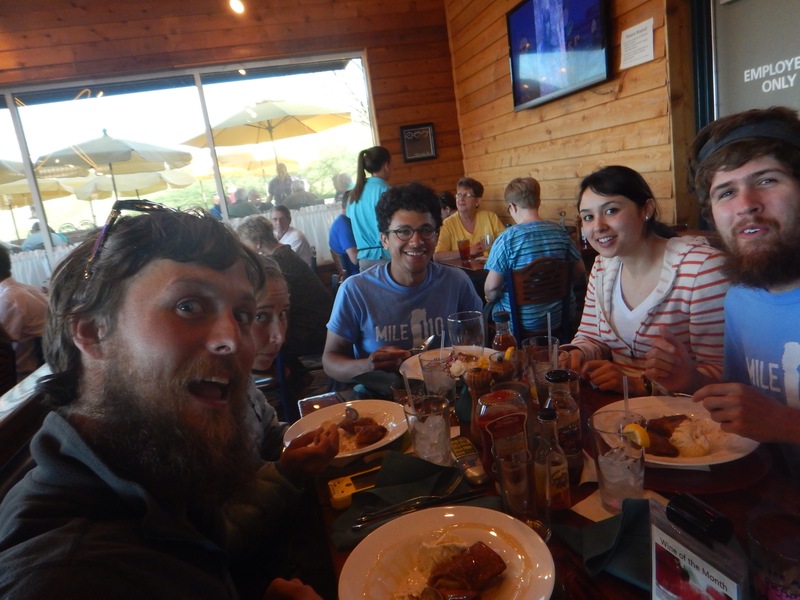 Simply for being thru-hikers, we all received a free dessert: fried cheesecake with ice cream! It was worth the over 720 mile walk just for the free treat. That night we had a knock on the door. We were expecting a visit from Eddy, her father and her sister, who had hiked farther than planned in order to meet up with us in Daleville. When I opened the door, they yelled at me! “Close the door,” they ordered. I obeyed. “Who’s there?” I shouted back through the closed door. “Neigh!” they cut me off. I guess Joe hadn’t forgotten how much Nate and I appreciated his interrupting horse joke in the Smokies. I opened the door and invited our friends inside. They ordered pizza and we spent the night sharing stories. Much to everyone’s disappointment, Eddy was unable to retrieve the men’s wedding ring for us from the shelter at which we had found it a few days prior. We assured her that Lucky was also on the lookout, and he would not let us down! When Eddy found out that Yoyo and Tweet were at the hotel, she demanded we find out what rooms they were in. She wanted to continue a trail magic tradition that she started on the trail by leaving Snickers bars outside their doors. Nate texted Tweet and told Eddy their room numbers. Eddy pulled out two candy bars, balanced them against the doors of Yoyo and Tweet, knocked and ran away. A short time later we had another knock on the door. This time we were not expecting anyone. Eddy jumped up to answer it, but when she opened the door, there was no one there. Instead, there was a pizza on the doorstep! It was still warm! 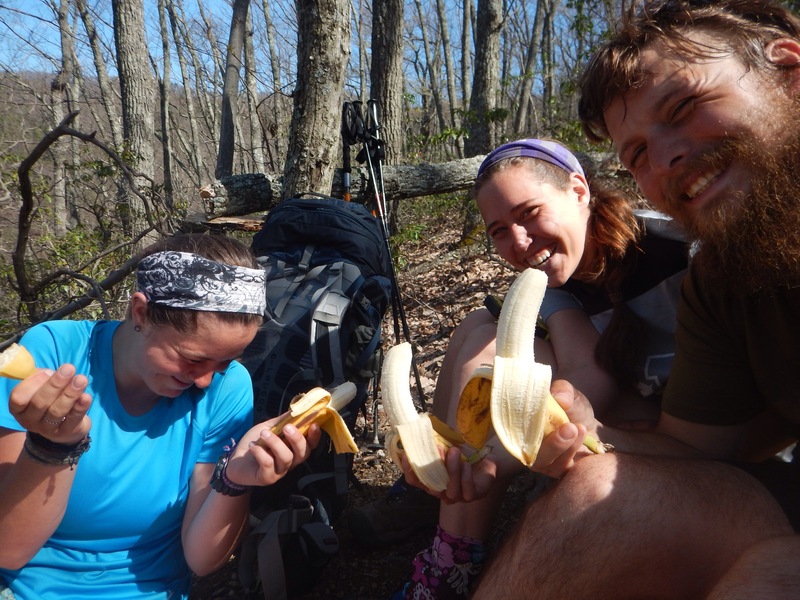 Though we had just eaten most of the two pizzas the Franklins had ordered, thru-hikers always have more room for pizza. We continued filling our bellies, chatting and laughing late into the night. Our errands took longer than we expected in the morning, delaying our departure to two o’clock. We ordered summer sleeping bags and my new pack, arranged our next off-trail night with one of Nate’s high school buddies and asked Nate’s mother to ship us our next pair of boots. Then we remembered that we wanted to buy new insoles for our dilapidated boots and jimmy up a new seal for our Sawyer water filter. When we finally hit the trail with Eddy, we had to face the fact that we no longer had time to hike the twenty miles we had originally planned. With full packs and bulging bellies, it was a struggle for us to make it to the shelter just twelve miles outside of town. We invented a game to pass the time. “Stump the Chumps,” consists of a Stumper, who chooses an actress or actor and answers yes or no questions posed by the Chumps, who attempt to guess the famous person. The Stumper who stumps the chumps for the most miles wins. I won. But it was only because I, too, did not know the name of the actor I had chosen. We got to the shelter just as the sun was sneaking behind the bare trees on the side of the hill. Yoyo and Tweet had already set up their tents and eaten dinner. There were two young lads from Great Britain at the shelter. It was the first night of their 3-month-long hike. Eddy socialized with them while cooking her dinner but Nate and I cooked our food at our tent. Nate wasn’t feeling well and I wasn’t hungry after gorging myself in town. All we ate was Ramen noodles. We fell asleep hoping for more miles the next day. Our feet hurt. Just 100 miles to go before new boots, all we could do is keep walking north. A few miles into our day we crossed the Blue Ridge Parkway for the first time. We were sitting at a concrete picnic table and ate a snack when a tourist-filled minivan pulled into the overlook beside us. The side door slid open and a man with a camera hanging from his neck climbed out. He waved at us and snapped our picture. Then he pointed his camera in the direction of the view. Before we knew it, he was back in the van and it was creeping back toward the road. We felt like we were as much of an attraction to the man as the view was. The last hill before the shelter was a doozie. I ended up leading the way, as I wasn’t feeling the previous 18 miles as much as Nate or Eddy, but all three of us were glad when we got to the top. We were even happier to come upon the shelter earlier than we expected a few miles later. The shelter was huge and Yoyo and Tweet had already set up their sleeping bags in the loft and eaten their dinner. Eddy joined them upstairs while we set up on the main floor. Just as Eddy, Nate and I were sitting down to eat our dinners, the Brits showed up. 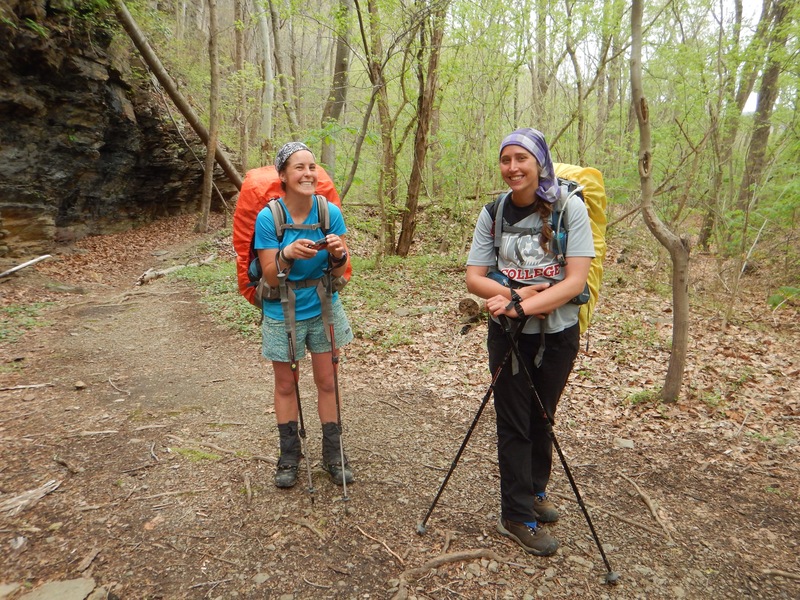 We were all surprised that they were able to walk twenty miles on their second day of hiking. We warned them against walking too far too soon. Then, the three of us ate our food and listened to comedy skits on Nate’s phone. The minute we stepped out of the shelter, the skies started drizzling on us. According to the forecast, today would be rainy, “mostly before noon.” Knowing we had over 50 miles to walk to our maildrop full of food, we were set on hiking 18 miles and finishing at a campsite, even if it meant setting up the tent on soggy ground. The forecast was wrong. The precipitation morphed from a drizzle to a downpour by ten o’clock and continued for hours. Certain that we would be wet no matter what we did, Nate and I did not put on our rain coats. We had our ponchos on from time to time, but the wind lifted Nate’s over his head one too many times and he thought they were more hassle than they were worth. We got soaked. At noon, while trudging through a puddle-filled trail up a mountain, we got cold. Realizing the time, we hoped the rain would end soon, and we aimed for the next shelter where we could sit under a roof, eat a snack and wait out the rain. We got there at 1:30. We never left. Shortly after we showed up, Eddy arrived. Ironman pulled in after her (He had done over thirty miles the day before and made it to the shelter we had all stayed at after everyone else had fallen asleep. No one heard him come in). There was a southbound section hiker, Scooby, cuddled inside his sleeping bag at one end of the shelter. 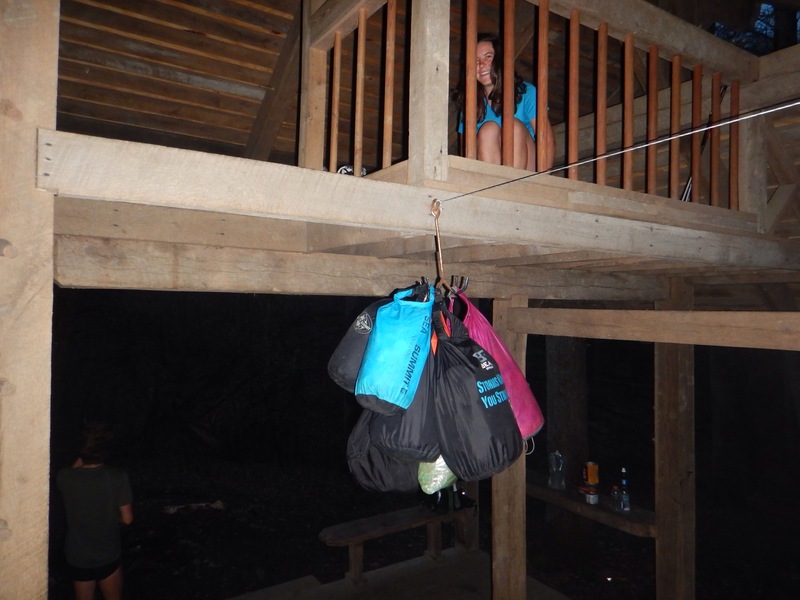 Hesitant to take off our wet clothes, for fear of putting them back on, but knowing that we needed to be dry if we were going to be stationary, we pulled our extra clothes sacs from our packs and changed our attire. Then we plopped down and waited. And waited. And waited. It only took an hour of waiting to decide that we wanted to be curled up in our sleeping bags like Scooby was. And it only took a minute of being curled up for us to know that we knew we were done hiking for the day. We had only moved ten miles up the trail, but we were soaked and it continued to pour. Under these circumstances, a half-day was acceptable. We justified the meager miles by writing and working on videos, but it wasn’t easy to do with everything else going on in the shelter. Eddy and Scooby sat on one side and shared funny stories while Eddy was also supposed to be writing her blog. Every once in a while, she would snap her head up, hold her pen to her mouth like a microphone and host the Shelter News. Scooby was the weatherman, I was the sportscaster and Nate was the interior designer. It was a riot. Ironman fell asleep in the middle of it all. By the time the day turned to night, the shelter was bursting with eight wet hikers. The Brits had shown up, along with a southbounder named Fireball. Labeled a six-man shelter, it was a tight squeeze to fit everyone in, but no one was going to force another hiker out into the wet and gloomy darkness. It was still misty when we woke up but we knew we had to hike or else we would run out of food. By midday, the threat of rain had passed and we were happily trekking across the James River. We made it to the 16-mile shelter with time to spare, and stopped for a break to decide what to do. Ironman had a family friend who was available to meet him that night only. He had nine more miles to hike. Eddy, Nate and I had no one waiting for us but we still wanted to go further. We felt as though the nine mile shelter was too far, though, and there weren’t any campsites or many water sources along the way. After much deliberation we decided to fill up on water at this shelter and start the trek up the next mountain. We were certain we could find something on the ridge line. Almost immediately, we began to doubt our decision. Nate felt the extra weight of three liters of water and the steep climb was not helping. Everywhere we looked was rocky or not level or both. There was nowhere for one tent, let alone two. Just before we reached a break in the ascent, we got a view of the James River winding through the mountain range that we had been trekking through for the past day. It was lovely. A few stone steps further up the mountain we found ourselves a perfect, flat campsite, with a spot for Eddy, a place for us, and room to spare. Wanting to make sure that this site was worthy of stopping early, Nate and Eddy threw down their packs and ran up the next incline. I stayed behind. “This is perfect!” I heard them shouting from atop the rocky hill. “It’s going to be an awesome sunrise!” They came back down to the campsite, claiming that I would see the best sunrise ever the next morning. All I had to do was wake everyone up. Nate set up the tent, allowing me to call my mother and tell her about the wedding plans Nate and I had come up with. It had been the topic of discussion ever since he proposed. When I finished talking to my mother, I called my sister. By the time I was done chatting, Nate had a warm dinner and a crackling fire waiting for me. What a guy! 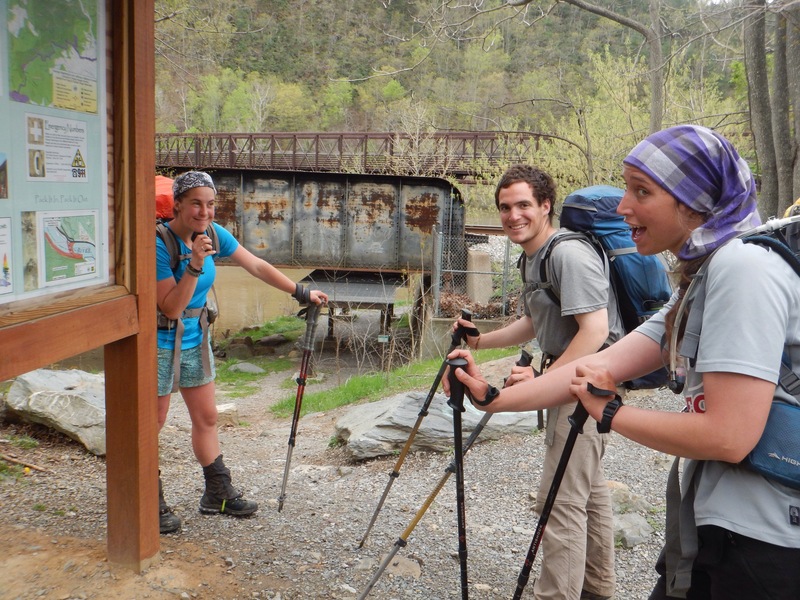 On a hiatus from medical school, Sharon is thru-hiking the AT with her boyfriend Nate. Having conquered thirteen of the forty-six high peaks of the Adirondacks, a 115-mile week-long on the North Country Trail and a month of hauling their packs around their tiny hometown, they think they’re ready to make it To Katahdin.